I received an email not long ago from the folks at WordPress. I’m sure many of you may have received it as well. It was about avoiding the grammar police. I didn’t read the email, although maybe I should have, but I’m pretty sure my grammar isn’t all that terrible. I did of course have English in school, but I finished school more than thirty years ago. Sister Charlotte, my freshman year English teacher was deaf. Seriously deaf. So deaf that we obnoxious young ladies of St. Scholastica would run our pencils along the grated book holder attached to the desk when her back was turned just to make sure. She was a very sweet old woman, far nicer than we probably deserved. It was the year in high school that we were supposed to be focused on grammar, but sadly we didn’t learn a lot. It was there however that I discovered my favorite book, Jane Eyre by Charlotte Bronte. All these years later it is still my favorite. I reread it from time to time for pleasure. The other year in my academic life that was focused on grammar was seventh grade. Mr. Helms, a former Boys Town educator, was my teacher. We were terrified of him. Rumor had it that he killed a kid at Boys Town. There was a boy in my class, Austin H., a troubled kid who I later heard sadly died young. He acted out in class one day and Mr. Helms took him out into the hallway. I’m not sure what happened, but everyone swore there was blood on the wall. I don’t think he even noticed me, well except to call me Marion. Marion is my older sister, she is blond, I was not. Unfortunately seventh grade was also the year my eyes abandoned me. I desperately needed glasses. It took me the entire school year to convince my Mom that I was blind, so essentially I missed the whole year. I couldn’t see the board if my life depended on it, and I was far too afraid of Mr. Helms to talk to him. I suffered in silence. These days thanks to “spell-check” my spelling is usually correct. Except that once in a while it changes a word on me that I don’t catch until the next day when Dan points it out. I don’t know about anyone else, but I swear I read and reread several times before I publish, yet there it is, the wrong word. It happened to me just last night. As for the spelling, I recently heard about a German study that is going on. The German scientists are testing their theory that when we get older our memories fail not because we are decrepit (my word, not an official study term), but because our brains have so much information in them that it takes time to push through all the clutter and find what we’re looking for. (Again, me) I love this theory, it makes me happy. As for grammar, I have been corrected from time to time by my children. They are very smart and educated people, so am I, I just don’t put as much thought into sentence structure. I write like I speak, although I probably don’t use as many commas or my infamous ” …’s” when I talk. (Is there a name for …? Dot, dot, dot?? Is it etc.? I forgot, it’s in the back of my cluttered brain) I do care that what I write is readable but I’m more interested in getting the thoughts out of my brain and onto the page than sweeping through the cobwebs in my mind to remember that I am writing a really, really, really run on sentence. This morning Dan and I had a wonderful hike through the lovely Santa Rosa Plateau. 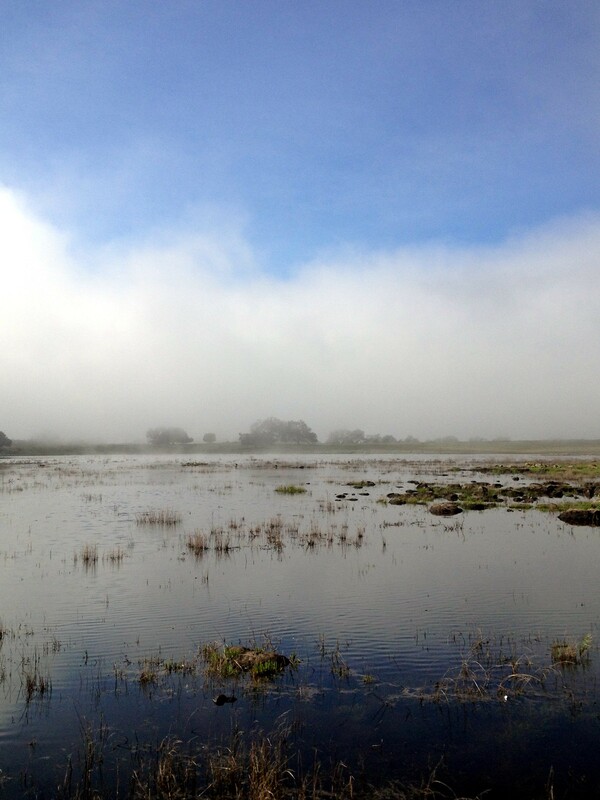 We were fortunate enough to see the vernal pools. Vernal pools, also called vernal ponds or ephemeral pools, are temporary pools of water that provide habitat for distinctive plants and animals. (That sounds really smart doesn’t it? It’s from Wikipedia.) We are lucky enough to have these pools at the Plateau in the Spring. We got out there at about eight thirty. It was sunny, but there was still fog billowing in from the coast. Just beautiful. I was inspired to try to capture some of what we saw in pastel. Pastels are not my strong suit. I find them a difficult medium and don’t understand why I torture myself with them. 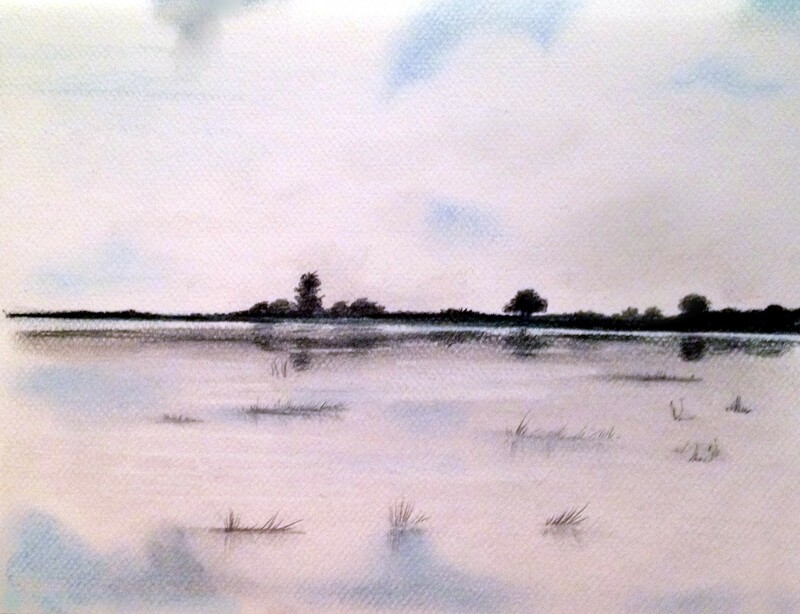 First photo is my pastel of the vernal pools. The second photo is God’s handiwork, I just snapped the picture. This entry was posted in art, Art and my life, Drawing, Fine Art, Humor, Pastels, Photography, Uncategorized, Words, Writing and tagged art, California, Catholic, drawing, Fine art, humor, illustration, life, loving words, Nature, pastel, photography, projects, thoughts, Vernal pools, Visual arts, writing. Bookmark the permalink.